When using any flours/grains, nuts, seeds, etc - make sure they are labeled gluten-free. Gluten contamination of these products are very likely if they’re not produced in a dedicated facility. Peggy's Aunt Edna makes the best cutout cookies. Many years ago, Peggy learned how to make them. They continue to be holiday family favorites - except for me. When I had to go gluten-free, this meant an end to these cookies. Since 2003, Peggy has been trying to replicate these beloved cookies. Many different custom blended and commercial flour mixes have been tried. While the GF versions of this cookie have been good - they still weren't like Auntie's cookies - until now. These cookies are the closest version yet. They remain crispy on the outside, soft on the inside - even after freezing them. 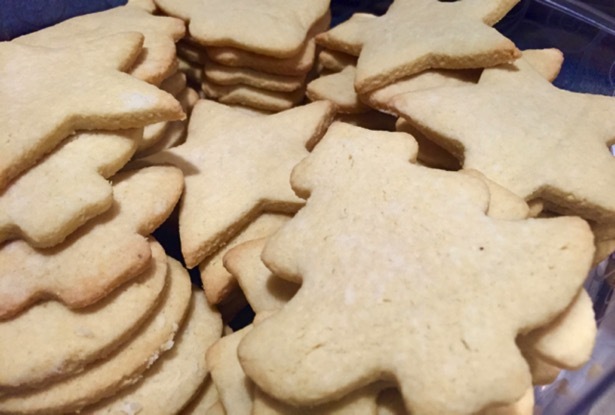 Step aside Almond Flour Sugar Cookies, there's a new favorite cutout cookie in town. Potato or Tapioca starch (not flour) for rolling. *The amounts listed are approximate. Adjust them until it's as stiff or loose as you like. In mixer bowl, cream butter, sugar & vanilla together. Add dry ingredients - mix throughly - at least 2 to 3 minutes. Remove about 1/4 of the dough keeping the rest in the fridge. Dust counter with starch. Coat dough until it's no longer sticky. Roll dough to 3/8" thickness. It is best to keep these cookies on the thicker side. They are a bit fragile. Bake at 375 for 8 to 10 minutes - until edges start to brown. Note: cookies brown quickly. Don't let them get too brown. Remove cookies from oven. Allow them to cool on the pan for 5 minutes. Place on waxed paper. Repeat rolling & baking process until fresh dough is gone. Combine dough scraps, re-roll, cut and bake.